In today’s digital world, more and more software is becoming alive. This is due to a shift in the software industry from a linear approach to software development to an angile approach. Apps and websites are updated all the time, in small chunks, instead of being built in long development cycles, culminating with big releases. Thus, when the software product is launched, it is no longer the end of the development process for it, but the beginning. Naturally, if you are continuously developing your multilingual software product, you should also continuously localize it. You don’t want to leave behind any of your users when you roll out new features. Nor do you want to look unprofessional, by not localizing parts of your software in certain languages. So it’s a good idea to aim for a continuous approach on localization. POEditor is an online localization service and translation management system, designed to help all parties involved in the localization process on their quest to achieve a continuous workflow. 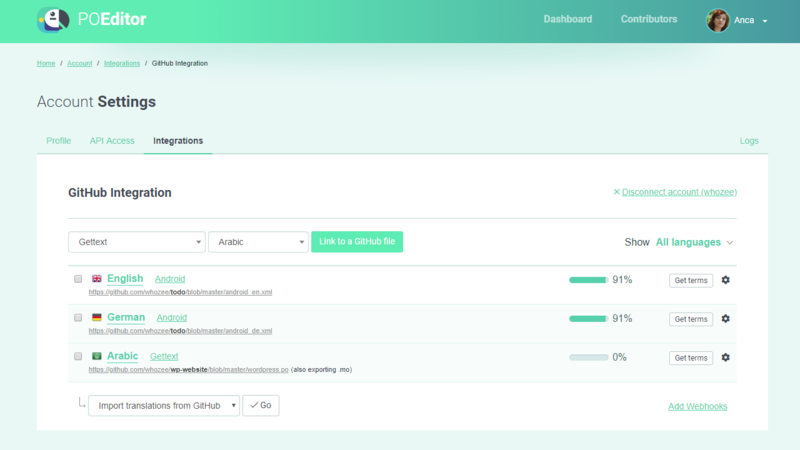 As a freemium SaaS, POEditor offers free and paid accounts and supports free of charge the localization of open source software with an OSI-approved licence. If you use a translation and localization management service like POEditor, you’re likely to see better collaboration between team members, an increase in automation and productivity, and more streamlined workflows all around. Connecting POEditor to GitHub, it becomes a lot easier for translation teams to receive string updates from dev teams. Also, dev teams find out in real time when new translations are ready and add them to the software. To start integrating POEditor into your localization workflow, first register or log in to your POEditor account. Then add a project in your Dashboard and the languages your software currently supports (including the source language). Then add the languages you want to further localize into. POEditor can connect with both GitHub and GitHub Enterprise. 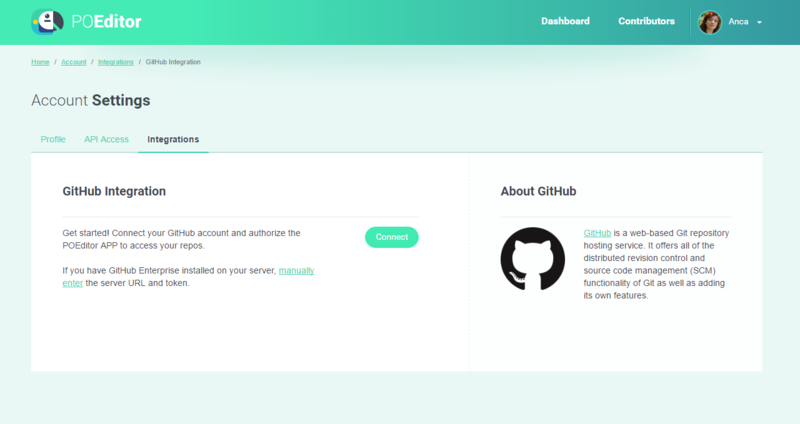 To connect, follow the instructions in the GitHub Integrations page, accessible in Account Settings. Once you set up the connection, you can start linking the languages in your POEditor project with the localization files in your repos. Import the terms and the translations from the source file and from here on, you can start customizing things. Each linked language has its own settings. In settings, you can tag particular groups of string on import (all, new, obsolete, with changed translations) or to set filters for exporting to GitHub. For a plus of automation, you can use Webhooks. They help to keep the files in your repos in sync with your POEditor projects. With a webhook, you or anyone in your team can update from anywhere the strings in your source language in POEditor. You can also signal (with the fuzzy flag) if translations in the other languages need revision. According to your resources and needs, you can combine the available translation options in whatever way suits you best. We have recently changed the way webhoooks work with POEditor in order to improve security. On March the 1st, 2019, we will discontinue the former webhooks format. This is just a change in the format of the webhooks, the funtionality remains the same, as described below. 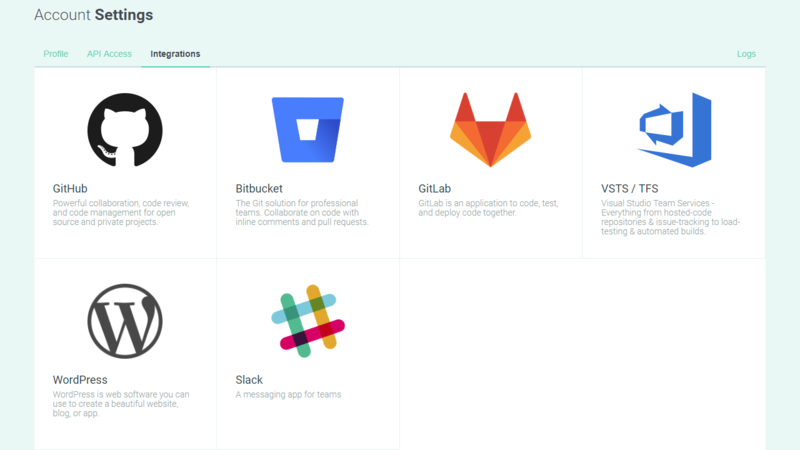 Webhooks work in the same way for all the code hosting services supported by POEditor: GitHub, Bitbucket, GitLab or Visual Studio Teams Service – VSTS. They can be called from anywhere, and can be maintained, modified and managed by any third-party users. In your account, you can access the webhooks page via the Add/Manage webhooks link in the bottom right corner of the integration page. Webhooks work on a project / language basis. So, if you have several files linked to a language, it’s enough to run one webhook with an operation and that operation will be executed for all the files linked to that language. Import new terms: Brings the terms (without the translations) from GitHub to POEditor. Import translations: Brings the translations from the GitHub file to POEditor for the matching terms. Import terms and translations: Brings the terms and the translations from the GitHub file to the POEditor project. Synce terms and translations: Brings the terms and translations from the GitHub file to POEditor, deleting the obsolete terms from the project. Export terms and translations: Takes the terms and translations from POEditor to GitHub, overwriting the original file. Overwrite Translations: overwrites the translations in the project with those in the file for the matching terms. Mark corresponding translations from the other languages as fuzzy for the updated values: puts a fuzzy flag on the translations in all the languages in the project, which correspod to the term with the updated value. We strongly recommend that you do not use the sync webhook if you have multiple files linked to the source language. The sync webhook deletes the terms which are in the project, but are not in the connected file. So you may end up losing terms you imported from other files. The terms from the file last synced is what remains in your POEditor project. 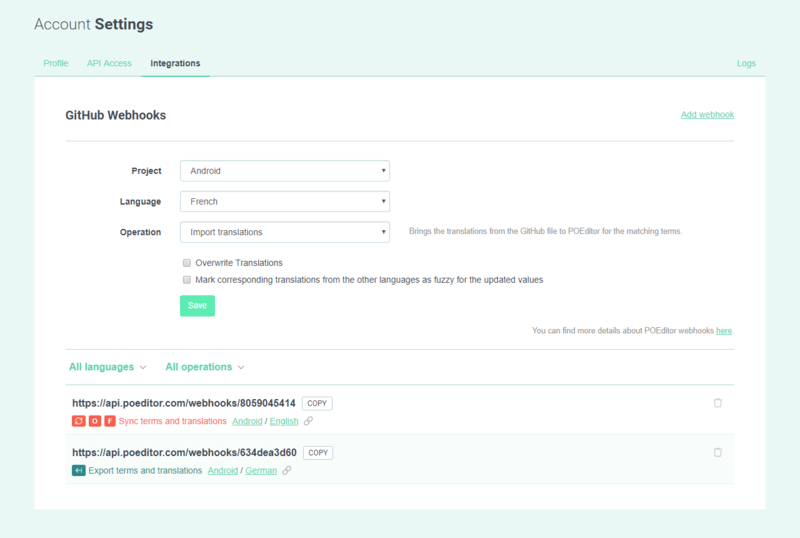 Webhooks are a simple solution to allow an admin or someone else to manage the data between POEditor projects the GitHub, Bitbucket, GitLab or VSTS account connected with the localization project owner’s POEditor account. First, the project owner should set the links between the language file in your repo and the corresponding language in POEditor. After this, anyone can trigger the updates both ways: to get the terms (and translations) from the repos and to export the translations in POEditor to the linked file in your repos. You can easily observe your webhooks activity with the help of the Webhooks log which stores for 30 days all the requests that can be identified as being yours (using a webhook generated from your account). If you are not using webhooks but are looking for a solution to automate the synchronization between the POEditor localization platform and your repos, then we encourage you to give these “user-defined HTTP callbacks” a try. If you’re using them and have not already switched to the new format, we encourage you to do so, for better security and in order not to experience any interruptions in your workflow. For any questions or feedback, feel free to drop us a comment or an email at info@poeditor.com. According to the nature of your project and the localization resources you have available, you can choose to translate strings with POEditor using one or a combination of the translation options below. Whether your company has its own translation department, you collaborate with a translation agency or you have some friends willing to help with the translation, this option is for you. You know exactly who will be translating the project into what language. Assigning a contributor to a language in a POEditor project is easy. There’s an ‘Add contributor’ button in the Project page for each project language, and one in each Language page. Click on one of these buttons and type in the name and email of the person you want to assign to the language. They will receive an invitation to join your localization project, which will allow them to start translating right away. You can add contributors to a localization project via API also. 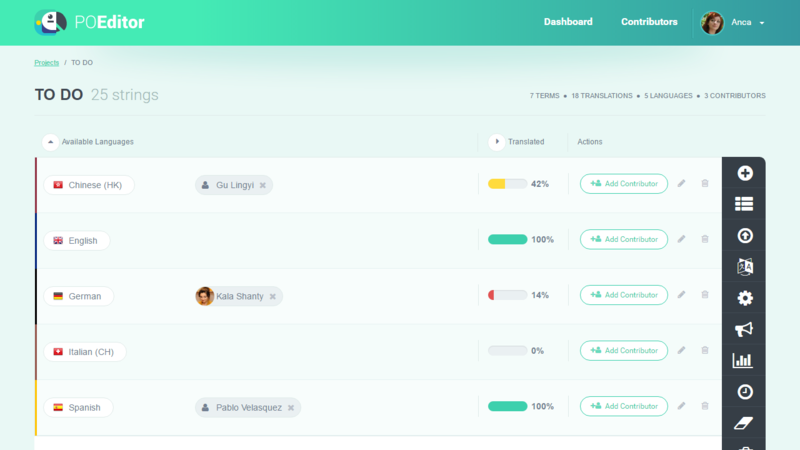 If your project needs to be localized into a language quickly and professionally, and you don’t have a translator to assign to your project, the human translation order module is what you’re looking for. At POEditor, we offer an integrated translation order system, which allows you to seamlessly send strings to professional human translators. 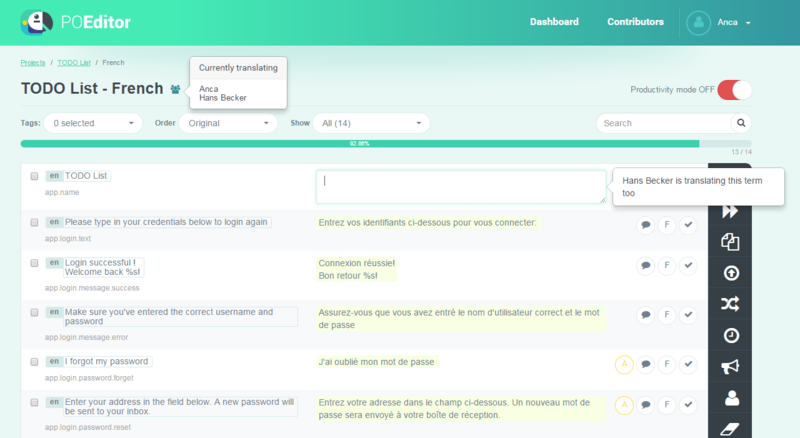 Once the translations are completed, the localized strings are sent back to your POEditor account and you can import them to your project with a few clicks. No need to send localization files back and forth, or for any external accounts/keys/credits. Have an active community, who you would trust with localizing your project? That’s where public projects come in. 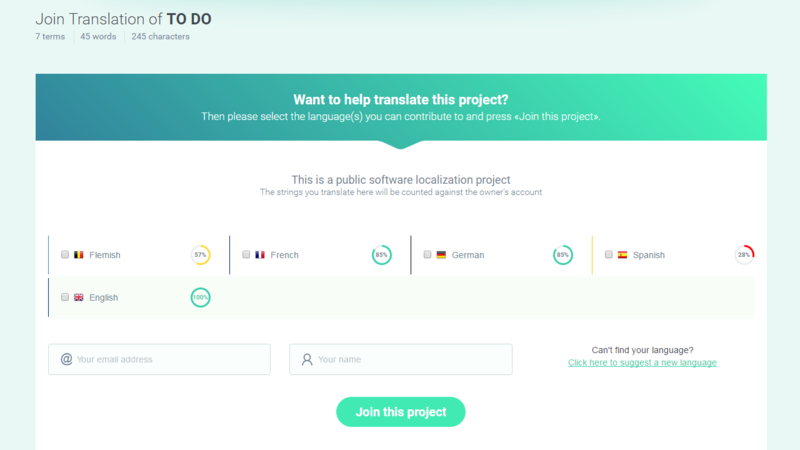 After you make your localization project public in Project Settings, you can share a link to its public join page, where anyone can volunteer to translate into one or more languages. There are ways to control the access to your crowdsourced localization project. For new contributors, check the options available in Project Settings > Advanced Settings. For current contributors, see the Contributors page. More information about public projects is available here. For pseudolocalization purposes, or for the translation of short, simple strings, you can always opt to use machine translation engines. We offer two vendors for automatic translation, Google and Microsoft Translate. To access the Automatic Translation feature, click the button with the same name in any Language page. As handy as it can be in some cases, and as much as it may have advanced over the years, we would advise you to use human translation for production environments. Have you decided upon the localization strategy you are going to use for your project? Feel free share your thoughts by leaving a comment below. If you register to the POEditor, you get an account with a Free plan by default. The free account can accomodate software localization projects summing up to 1000 strings, which is usually enough to translate a small app or a WordPress theme into a few languages. 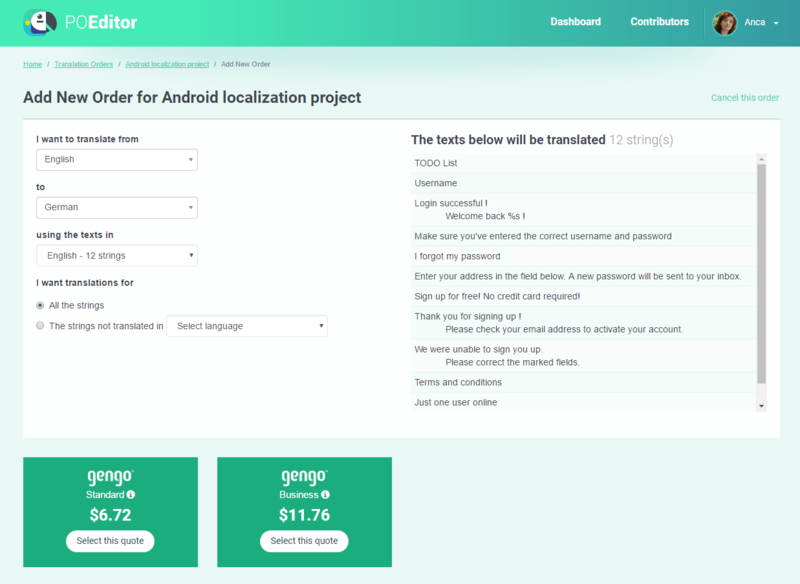 Also, you can use your free account to contribute without any limitation to localization projects owned by other users. The strings you translate for others are counted against their account. Free plans, like all the other POEditor plans, can host an unlimited number of projects, languages and contributors. But, unlike accounts with paid plans, free accounts don’t come with a Translation Memory feature. At POEditor, everyone in your localization team can find tools to increase productivity and simplify their part of the job. Below, I present some main features our localization management platform offers to improve automation. At POEditor, we are dedicated to bringing you the best interface where you can manage your collaborative translation work. We know it is essential for any localization project manager or translator to stay updated with their team’s whereabouts and actions, in order to maintain a smooth and natural workflow. So, to avoid stepping on each other’s toes, we’ve built POEditor with a Realtime Translation System. The POEditor Realtime Translation System is good for all POEditor users, regardless of their role in a project. First of all, it is useful for contributors, because they can see who is active on the same language as they are, at the same moment. It also shows them in real time if a translation is added, edited or deleted for a term in that language. If there is more than one person translating on the same page, the system will mark the translation fields that are being worked on by coloring their borders. If two or more contributors are on a translation field at the same time, a bubble will inform them who else is translating that term. The POEditor Realtime Translation System has been well improved to give even more useful information to localization teams in their efforts to provide quality software translations. Unwanted events, like translating a string twice, for example, can easily be avoided with it. In case you have feedback that you would like to share with us, don’t hesitate to drop us a comment or to use our contact form to get in touch. Here at POEditor, we’re always trying to optimize and improve performance. For this reason, in the past few weeks, we’ve been really busy reconstructing our Translation Memory engine. Given the growth rate of POEditor and the number of strings in large accounts, we began noticing some delay in the TM for suggested translations, especially when the system searched for translations of small strings (such as “Account” or “Cancel”). Some tests and debugging quickly pointed us to the database queries, which had become slower as the database increased. We then took a radical decision, to move all the TM related searches to a dedicated search engine. 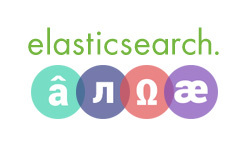 After lots of research and tests, we choose Elasticsearch, which is based on the powerful Apache Lucene project. Elasticsearch is a flexible and powerful open source, distributed, real-time search and analytics engine, running on Java. To cut the technical stuff short, the performance improved by a factor of more than 10 times in some cases and it’s expected that the future growth won’t affect the system performance as it did before this. 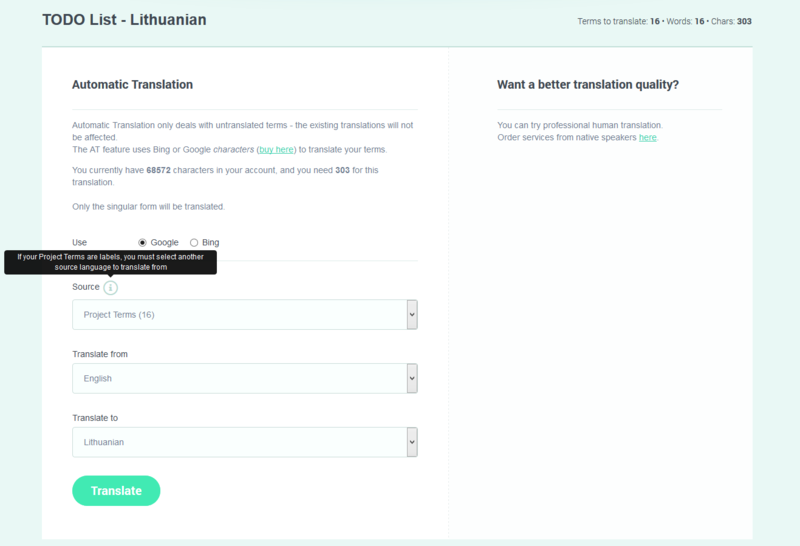 We would like to see you test the limits of the Translation Memory engine, with countless translations from old and new localization projects. You will surely be compelled by how this powerful piece of software enhances the automated part of the POEditor experience! Happy 2 year anniversary to us! We are proud to let you know that on the 2nd of August, two years ago, the project that came to be the POEditor you know today first saw the light of the Internet. Although we couldn’t imagine how far we’d get back then, we believe now that our localization platform has grown into a beautiful piece of software that is valuable to many people all over the globe. Along the way, we’ve added new & useful features and updates, always taking into account your opinions for improvement and other requests, making it our assumed duty to deliver to you in the shortest amount of time possible. This is the kind of relationship we will continue cultivating with our users. A big thank you to everybody for supporting us and for using our product. We hope to keep on growing together while you enjoy POEditor for years and years to come. We recently made a list of all the formats we support for localization projects, and gave a few explanations for each of them, linked to POEditor’s expectations. We take the chance to clarify a question that keeps popping up in our mailbox: why do we not support certain formats? The short answer is because of the perspective from which we’ve built the entire translation platform: we preferred to treat every localization job from a project point of view, and not as a mere file translation. For this reason, we need to be able to import every localization file format to the same list of terms and translations, so we can provide back to our users the same content, in the same format, flawlessly. Taking this into consideration, and the fact that we don’t like to “partially support” language files, we’ve arrived at this list of main formats. The current list of formats is not final, of course, and new additions will be adapted to this vision, so our users won’t get the feeling of getting too technical. Gettext .po and .pot files, Excel .xls and .xlsx files, Android .xml files, Apple .strings, Microsoft .resx and .resw files, Java .properties files, .json text files. Today we’re going to tell you all about our special academic discount program. We know that professionals entering the localization industry come from many different fields (marketing, international studies, language studies and so on) and that their number, as their need for technical accommodation, is growing by the day. Thus, for educational purposes, POEditor developed the academic program. It consists in a 50% discount on all subscription plans for academic institutions and individuals, and it is aimed at encouraging hands-on practice for those in the academia hoping to achieve a better understanding of what the process of software localization entails, and how the commercial translation environment looks like. Students and professors can get familiar with cloud localization by using the POEditor platform, benefiting from unrestrained access to all of its features, at a privileged half price. All that is necessary to qualify for our special academic discount program is to be a part of the academia, as a student, teacher, or researcher. Verification is done by email address, so you will need an educational email address matching the school’s domain name with which to register (for free) on POEditor. To benefit from our special academic discount program, you will need to contact us by e-mail, specifying which address you used to register. After checking that the requirements are met, we will provide a unique link that will get you 50% off on your chosen subscription plan. POEditor is an easy to use software localization platform that allows users to translate their projects using the power of their own community. For more information, see our website. Copyright 2019 Code Whale Inc.